The improved FishTix™ II Cable installation kit is designed to pull large, heavy cable bundles across long areas such as cable trays, suspended tile ceilings and even under raised flooring common in data rooms. Great for data and communications installations, the FishTix 4ft. rod sections are made of a flexible non-conductive tubular material with snap together detent connectors. Snap the rods together to reach your desired length – in cable trays, the length can be infinite! The FishTix rods offer extreme tensile strength capable of handling over 200lbs. of pulling force. /n The standard kit comes with twelve 4ft. rods for a total available length of 48ft. Additional 4ft. sections can be added or multiple kits can be combined to reach longer lengths. The 4ft. 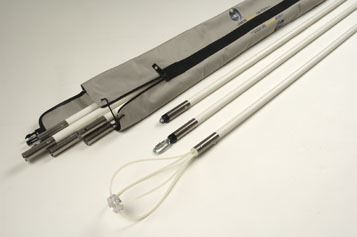 rod length allows you to assemble your rods together in confined spaces. The kit also comes with a resilient whisk head that can be used to ride up over beams, ceiling tile grids, joists and existing cable runs. Includes a full nylon carry case for storage with a convertible shoulder/hand strap for easy transport.